Fast cars, fantastic features, and futuristic wins, Drive: Multiplier Mayhem is the adrenaline fuelling slot you need to play. This 5 reel, 15 fixed payline video slot will give you “The Fast & The Furious” experience you’ve always dreamed of while revving up your bankroll. The slot has a speedy, futuristic theme and comes with two impeccable bonus features and a random Multiplier Wilds feature in the base game. Jette –the good girl– takes it in this slot machine up against the bad guys Twitch, Hamaki and Bruiser. The slot is a mid-level casino game that can be played by anyone and everyone with a love for fun features, fast cars, and big wins. The slot provides you with a jackpot winning opportunity of up to 5,000 times your bet. 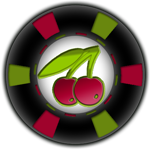 If you play at the lowest coin value you’ll pay about 0.15 per spin and for those wanting to go all out you’ll pay a maximum of 75 per spin with the coin value at 0.50. 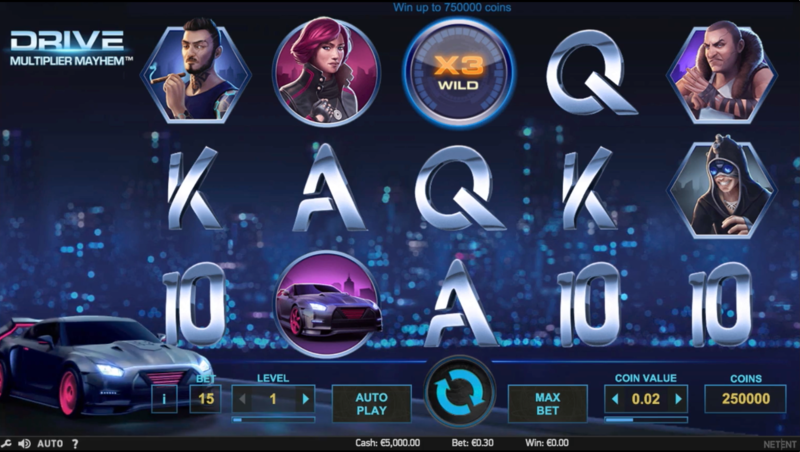 The slot is playable on all devices and despite the superb high-quality graphics it runs beautifully on desktop, mobile, and tablet devices. 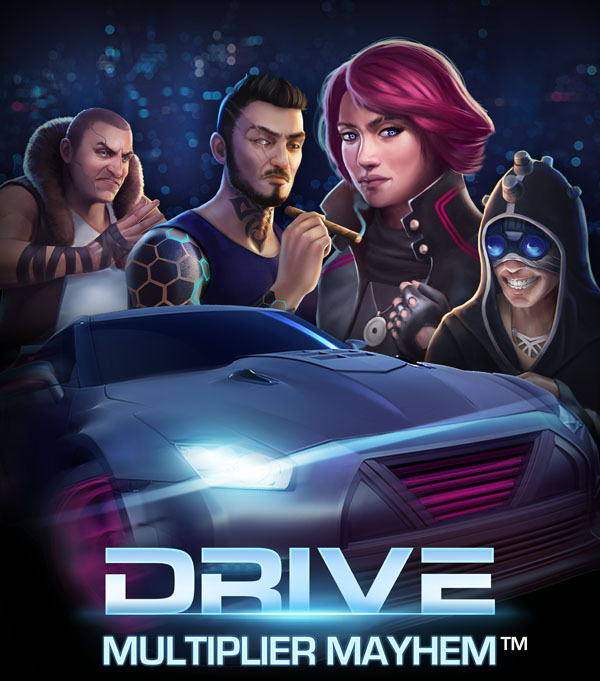 The Drive: Multiplier Mayhem slot comes with a variety of edgy, futuristic bonus features unique to the slot. The first bonus feature you’ll notice is the random Multiplier Wilds feature that takes place in the base game. The multiplier wilds can appear anywhere on the reels and they substitute for all symbols except the scatter and Nitro symbols. The multiplier wilds will show the same multiplier as the reel they land on and will up your winning combination. In other words you’ll want your multiplier wild to land on reel 5 in order to gain a 5x wild. Reel 1 gets you a single wild, reel 2 gets you 2x wilds, reel 3 gets you 3x wilds, and reel 4 gets you 4x wilds. What makes this feature incredibly exciting and rewarding is the fact that 2 or more multipliers on the same pay line will multiply the multipliers. Thus, if you get a Multiplier Wild on reels 4 and 5 you could end up with a massive 20x multiplier that will significantly increase your winning total. To activate the Free Spins feature you would need to land 3 scatter symbols on the middle reels. You will start out with 10 free spins but landing 3 Nitro symbols on the three middle reels will not only get you extra free spins but also overlay multiplier wilds. These multiplier wilds can appear at any time during your spins, one at a time. All collected Nitro symbols will be stacked in the Nitro Collect Meter from the bottom to the top. During your free spin games you will start off racing against your first opponent, Twitch. If you manage to collect 3 more Nitro symbols you will move on to the next level where you win a random Overlay Multiplier and meet your next opponent. If you manage to collect two Nitro symbols in one spin and 3 Nitro symbols in your next spin, the 2 extra Nitro symbols will be carried forward and used in your next level. Your final opponent will be Bruiser and if you manage to collect 3 Nitro symbols when racing against him you’ll race until the end of the Free Spins. Overall, the slot is packed with bonus games, features, and free spins that are all related to the theme and contribute to the thrilling experience while providing a multitude of winning opportunities. Drive: Multiplier Mayhem is an all or nothing slot with a thrilling design, theme-related sounds, and exciting winnings possibilities. Over the years there have been many slots with a car or race car themes, but in all honesty none of them compare to this monster of a slot. Another car themed slot that pops into mind is Microgaming’s Mega Moolah 5 Reel Drive video slot, although Microgaming used in this video slot more a road trip theme than a Fast & The Furious theme. The theme in Drive: Multiplier Mayhem is very well done: on the left hand side of your reels you will see a beautiful, futuristic sports model driving in full gear. Even spinning the reels will give you a thrill as you’ll hear that exciting sound of a well-built car revving in high gear, it’s even pleasing when you hear the car brake although it normally means you missed out on some winnings or building wild counts. There have been many slots with more simplistic racing themes but Drive: Multiplier Mayhem is something out of this world. The excitement of playing this game is heightened by the fantastic soundtrack and the brilliant graphics that will leave you feeling like you’re part of the race crew in The Fast & The Furious or (for video game junkies) Need for Speed comes to mind. The only difference is that with this game you’ll not only be racing for the thrill but for the chance to score up to 5,000x times your stake! Most online casinos offer you to play the Drive: Multiplier Mayhem video slot for free as well, so you can see all the features and decided if you like the slot machine. You can also just check this Youtube video clip to see all the features and bonus games. You can play the drive video slot, just like almost all other NetEnt video slots also on your smart phone or tablet. 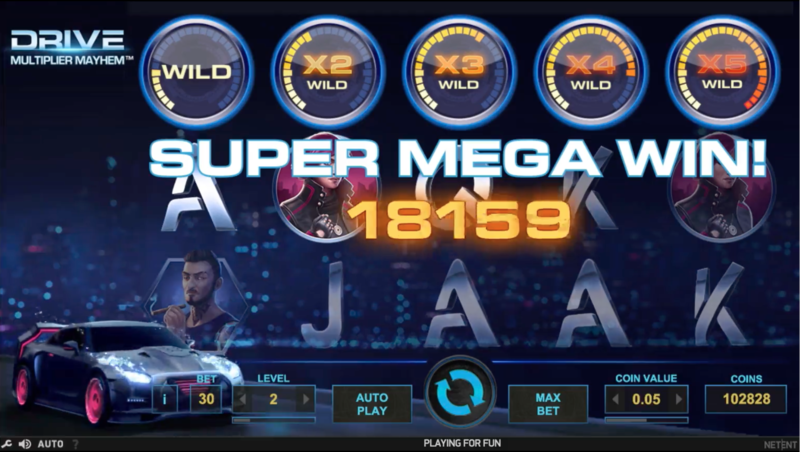 The mobile version of the Drive video slot has the same winnings, bonus games and features as the video slot which you can play on your computer. Drive: Multiplier Mayhem is a dream come true for adrenaline junkies, speed freaks, and jackpot chasers. It’s the ultimate slot that combines the elements of race car driving with constant winning opportunities. The slot is easy to understand and can be played by everybody from online casino newcomers to the veterans who’ve held down the fort for many years. 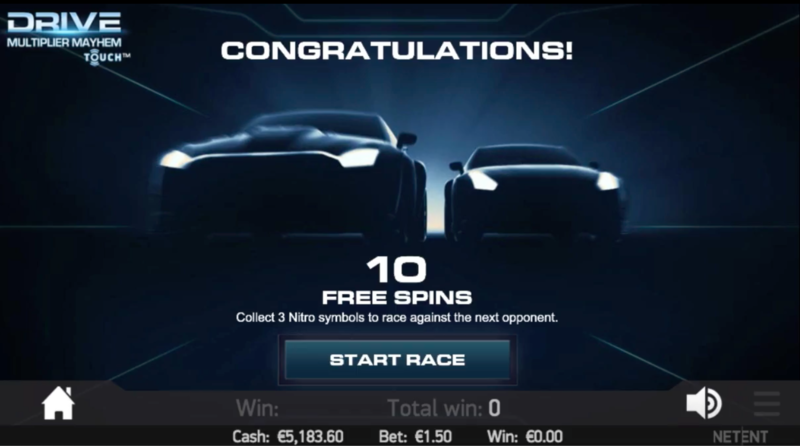 The slot also features a unique theme compared to other slots released by NetEnt and playing your bonus rounds while actually pit you against race car opponents and will leave you feeling like the fastest and most feared racer on the streets. Nowhere else in the online casino world will you find a slot quite like this one that offers you real races against awesome characters and Nitro Boosters that will rev up your winnings. It’s time to take it to the streets and test this speedster out for yourself, be sure to turn up your volume as it adds to the exhilarating thrill of playing the game.